Pay Off Credit Card Debt – TransUnion.com/power-to-achieve – Pay Off Your Plastic Sweepstakes. 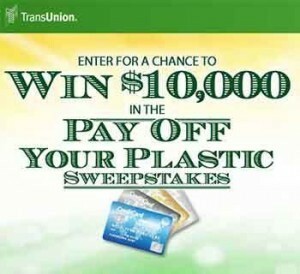 TransUnion Launched recently their Pay Off Your Plastic Sweepstakes, that Will Award Grand Prize Winner Up to $10,000 to Pay Off Credit Card Debt. How about winning a prize where you can swipe you credit card debt. At this time year that’s when most of us; consumers receive their Christmas shopping credit card bill. Sometime we would like to be able to hide our self under a rock, when we notice how much we spend on the last Holiday Shopping season. Is it just me or it seems that each season we are spending more than the other one! Each years things get more expensive and finally we get that huge Credit card bill! Would love to be able to sweep it by a blink of an eye. But unfortunately, as always each years we have to pay it! 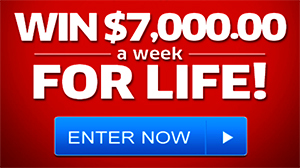 How about winning a sweepstakes that could take care of those huge credit card bills. This what The well known credit information and information management services: TransUnion (www.transunion.com) is offering you with their latest marketing promotion. TransUnion’s Pay Off Your Plastic Sweepstakes to help consumers tackle one of the number one financial resolutions — helping consumers paying down debt. To enter the TransUnion Pay Off Your Plastic Sweepstakes, sign up for TransUnion Credit Monitoring for just $17.95 a month by visiting www.TransUnion.com/power-to-achieve between January 14 and February 28, 2014. One lucky winner will be selected at random and TransUnion will pay down credit card balances of the Grand Prize Winner’s choosing, up to $10,000. Good Luck! Entering pch sweepstake to pay off all my credit card debt. I would do what I have done and give give give. I love the smile that happens when you do this. Please give me the gift to enable to get the help being work or a hand up when needed. I actually work to do this for Veterans to Breast Cancer to Canine Vets to Domestic Violence. I do more than this though. lately I have been making calls to help those that need to go to the City of Hope …. Everyone Amandas Gift and AutisticSpectumDisorder with special need therapy with Horses and dogs. Many many more. i have been reaching to other parties being individuals to businesses to help and enlisting their help would be outstanding for the site to help others give back also either in one way or another. I want to put to use all that PCH has to help me do this for masses of Others that will benefit from these programs to help our vets…. make a name known for Canine Vets and how to help these dogs have bills paid also. They are vets!!! to saving a lift or helping make it easier, to make a warm way thru a cold winter and to possibly even save a life. That is philanthropy and I want to make the world a little better when my generation is gone. Thsnk you so much for this opportunity. You all are so precious and have the best Job in the world. I know, I labout for others because it is fruitful and because someone needs to show others how to be this way in their communities. I ultimately want to educate and employ those that need jobs so that it is a sustained foundation. I look forward to winning it… because I am in it to win it! Millionaire in the Making : For The Spirit of Giving. Pls activate gwy6900 , gwy4650, “Superprize” and “Dream House” with “Forever” prizes. also the 19 unclaimed for the house. I posted in another place. I hope I only put a few here…. I have gold tickets claimed also. by me only….. my lotto numbers claimed by me: claim#803783705471, claim with Gold Ticket gwy #4950316025 ,Golden gift #659 , RB claims Ty352 “Dream House”, gwy1830 plus For Fusion So I may “Rev it up” gwy #4650, plus others from other comment in blog. Thank you for this opportunity to help others in a HUGE way in all areas; If its important pls bring to my attention and I will look into anything that is a cause to help. I don’t know if the phone is winning or the anticipation . Hollow PRIZE PATROL Elite Team, Todd Sloane, Danielle Lam and Dave Sayer. Yes I would love to Have the PRIZE PATROL Come to Ft WALTON Beach FLORIDA. SURPRISE ME WITH THE Big Check and plus a brand new Lincoln MKZ VALUED OVER$37,315.00 and plus more. Yes I would love to win $10Million dollars super prize giveaway NO. 4900. I want to Tag the 10,000,000.00 million dollars and I want to win bigI want the 5,000.00 a week forever and the new house the 2 million dollars 10,000.00 and the new car. I want it all.